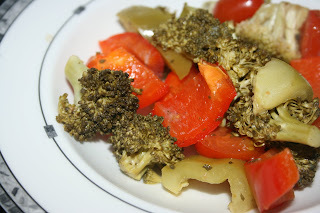 This is a very easy recipe for making a side of seasoned vegetables in the slow cooker. I like setting them up to cook when we grill outside the main course. Originally posted July 13, 2008 during my one year cooking challenge. One hundred and ninety-five. Holy cow. 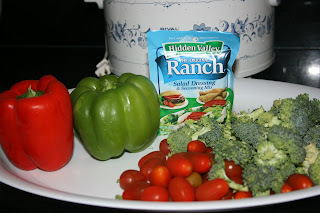 I made the easiest vegetables yesterday in my four quart crockpot. We had a busy day planned, and I wasn't able to get to the grocery store. We also have SO many leftovers from last week, that we needed to desperately clean out the refrigerator. --5 cups of fresh vegetables. I had broccoli, two different bell peppers, and tomatoes in the house, so that's what I used. I think carrots would have been a nice addition, and squash, if I had any. --1 packet dry ranch dressing mix (please read label carefully if you have allergies. I used Hidden Valley Original mix. --dump them into the crock. 5-6 cups of fresh vegetables will fit in a 3.5 qt or larger crockpot. Cover and cook on low for 2-4 hours. The vegetables are done when they reach desired tenderness for your family. I like vegetables to have a crisp to them, and took ours out of the crock at 2.5 hours. This is a simple way to have steamed, flavorful vegetables as an accompaniment to your main meal. My kids both really like broccoli, and they like ranch dressing. The flavor is mild, it isn't dripping in flavor; which is okay with me---we like vegetables to taste like vegetables. 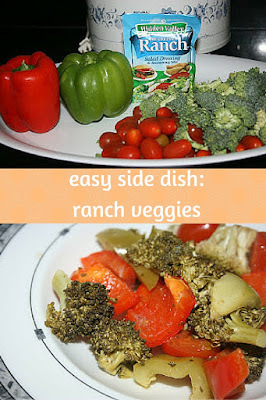 If you are trying to mask the vegetables completely, you might want 2 packets of seasoning. I was surprised at how much liquid formed in the crockpot. There wasn't tons, but I think you could get away with 2-3 tablespoons of water instead of a whole 1/4 cup. What a great idea for these summer days when vegetables are tumbling out every time I open the fridge! Did you use anything to keep the veg from sticking/scorching? i saw you on rachel ray and was wondering if you ever thought of growing fresh herbs for your daily recipes? i enjoy reading and thanks for the recipes! Hi I saw you on Rachel Ray and I checked your site out. I have printed a lot of your meal ideas off. I was wondering though... are all your meals gluten free? I have a friend that was just diagnosed with a gluten allergy and I would love to direct her to your site if they are. Thank you and I will continue to look for more great ideas. I tried your chicken teriyaki yesterday and it was wonderful. My kids and husband scarfed it down and we had no left overs! Today I'm making your peppercorn steak and it is smelling wonderful. My family has been salivating all afternoon. Thanks so much for putting your recipes and experiences on the internet for all to see. I caught you on the Racheal Ray show so that's how I found out about your blog. Keep up the great work! I only had a few minutes today to look; but, I'll be back! quinn, I didn't. You can always spray the crock first with cooking spray or wipe it down with olive oil if you are worried. jamie, they are all gluten free unless I say specifically that I'm not comfortable labeling it as such (I'm thinking the corned beef and the marinated meat). kristy, eek. I don't remember a crockpot cake link. I'll look for it in my inbox. sorry! lori, I'm so glad that you liked the teriyaki chicken! we liked it a lot, too. I saw you on the Rachael Ray show and I loved your ideas for the crock pot. I love my crock pot and I love blogging and I love the Rachael Ray Show...so it's a win win. I put a link from my blog to your blog if you don't mind. So, I have a great recipe for crock pot chicken with curry in it...if you would like to try it.I remember from the show you were looking for recipes with curry in it. It's a hit with my family so I thought I would pass it on to you. put in crock pot on high for 4-5 hours. Serve over rice. I've also used chicken breast but it turned out very dry. Anyway, I hope you like it. yay, Renette! I'm so happy to have been helpful in any way. keely, what a neat recipe; I've never thought of mixing honey with curry. thanks!! I just wanted to offer up a big fat congrats on your appearance on Rachael Ray! I am so happy for you and didn't see it but know you did a great job! I found you months ago from Today's Creative Blog and them moved, my computer broke... haven't been around for a while and lo and behold, you are still crock potting! Just wanted to say hello, find an easy meal and tell you--YIPPIE for you!!! Great recipe! I love crock pot cooked carrots and potatoes. Delicious! I think the peppers may have contributed to the water in the crockpot. We do bbqed veggies wrapped in foil and we find that if we do peppers alone they need only half the butter that our usual potatoes, carrots and brocoli need. And FYI, mushrooms need no butter when done as they make their own juices so I would think that if you were making veggies in the crock and were using mushrooms they would produce a fair chunk of liquid as well. Heat gives veggies the opportunity to share their water. (It is a little like you sweating in a sauna.) They end up giving flavor to each other. You just want to be careful to give them enough water to not burn in the crock, and not so much water that they are boiled into mush. This looks good. I might actually be able to convince my picky 3 year old to try this since it is ranch! Thank you! Adding this to my menu!! How easy and yummy!! I never even thought about cooking vegetables in my crock pot alone! Thanks for this recipe! Now I know how to make my veggies! This looks good! I will try this for sure! Trying this with chicken thighs added and DIY ranch mix. Can't wait to try it! !